FORESTRY Minister Michelle O’Neill today launched a Forestry Challenge Scheme which is designed to encourage landowners to plant larger woodlands. The Forestry Challenge Scheme, which will be delivered by the Forest Service, is an open tender competition, and will run from 25 September to 6 November. Expressions of interest forms must be submitted by 18 October. Contracts must be signed with successful candidates by the cut-off date of 31 December 2013. Applications to the Challenge Scheme will be assessed on cost and how they meet Scheme rules, enhance landscape character, provide biodiversity and community benefits, and are resilient to climate change and tree pests. Projects that deliver well designed woodland above the minimum threshold area of five hectares will be given preference. Up to £0.5million of funding is available for the creation of at least 100 hectares of new woodland. Successful applicants will receive up to 70% of eligible costs of delivery of their project over the first five years, and farmers converting land from agriculture will be eligible to apply for the annual Farm Woodland Premium Scheme and be entitled to Single Farm Payment. Minister O’Neill added: “I am committed to increasing the level of forest cover in the north of Ireland so that people can enjoy the range of benefits which woodlands have to offer. Landowners have a significant part to play in achieving this, and the Forestry Challenge Scheme is a pilot to encourage the creation of larger scale woodlands. It will supplement our existing forestry grant schemes, and I am bringing this forward now to build confidence in tree planting while we continue to tackle disease in ash and larch. The Forestry Challenge Scheme will be administered by Private Woodlands Branch, Forest Service, Room 5b Dundonald House, Upper Newtownards Road, Ballymiscaw, Belfast, BT4 3SB (Tel – 028 9037 8502). Further details and applications for the Scheme will be available from 25 September at http://www.dardni.gov.uk. Hard copies can be obtained from the address above. 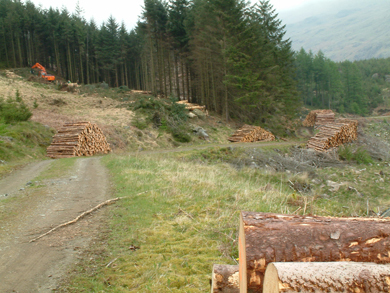 The Forestry Strategy (2006) has two main themes – a programme of afforestation and the sustainable management of existing woodlands. The Strategy identified a long term aim of doubling the area of forest from 6% to 12% of land area over the next 50 years, mainly through increased private sector afforestation of agricultural land supported by grant schemes part-funded under the Rural Development Programme. The area of forest is currently 8%. Uptake in for new planting in recent years has fallen significantly short of the rate of planting needed to achieve the long term aim of 12% of woodland cover, with farmers’ response to the Common Agricultural Policy being a major determinant on the rate and type of forest expansion; the recent impact of tree diseases has also put pressure on the sector. Forest Service offers grants for woodland creation under the Woodland Grant Scheme. The current grant for new planting is £1,600 per hectare for conifer, and £2,400 per hectare for broadleaved trees. The minimum eligible area is 0.2 hectares. Under the Farm Woodland Premium Scheme farmers are paid an annual rate of premium to compensate for agricultural income foregone. The current rate for arable and other improved land ranges from £200 to £290 per hectare; and £60 or £90 per hectare for unimproved land. The payments are for 15 or 10 years depending on whether the new woodland is either broadleaved or conifer respectively. Forest Service manages approximately 62,000 hectares of woodland, and approximately 44,000 hectares of woodland are in non-Forest Service ownership.